A big part of our role at Polly Singer Hats and Veils is advising ladies what to wear to the Kentucky Derby, and Derby Hats fashion. On May 6, 2017, we will witness the 143rd running of the Kentucky Derby, held at Churchill Downs in Louisville, Kentucky. My clients are from two different groups. The first group is ladies who attend the Kentucky Derby each year. They spend a good deal of their spring planning their outfit, dress, shoes, bag, jewelry and of course, a Kentucky Derby hat! They have some idea of what to wear, what is involved in attending the Kentucky Derby. The second group are ones who have never attended a Kentucky Derby and have no idea what to expect. Well, here is what to expect! It is a very long day. Longer than you can possibly imagine. I have tremendous endurance. I work out with a trainer, lived in New York City, etc. but I was drained at the end of the day. Wear shoes that you love, but can walk in. I got a tip to take a comfortable pair of shoes in your bag (even flip flops) to wear if you have to park far away or have a long to walk. Dress in layers. When I attended the Kentucky Derby, it was 50 degrees and cloudy! I had a sundress on, along with a cardigan and coat! Weather in Kentucky can be precarious in early May. It has snowed on Derby Day and also been 85 degrees with high humidity. The most popular question that I hear from clients is which comes first? The dress or the hat for the Derby? Pros: This options enables you to pick the hat of your dreams and gives you more freedom in terms of trims, colors and styles. Do you like peacock feathers? If so, you can incorporate them into the dress. Like hot pink, black and white? Then we can incorporate them into your hat. Cons: You have to find a dress/outfit to match your hat. This can be difficult if you are trying to match up colors. If a client picks the hat first, I usually suggest that they pick a neutral outfit to make things easiest. Pros: You already have your dress. By already having the dress/outfit, you have some guideline in choosing your hat. Say your dress has yellow and ivory, then you can tie those colors into your hat. Cons: You might be more limited in your hat choice. Also, depending on the hat supplies that your milliner has on hand, they might be out of the colors you are looking to use. There is no right or wrong way. If you see an outfit that you absolutely fall in love with, then by all means, purchase it. If you are undecided about what to wear, then pick out a hat that goes with an outfit already in your wardrobe. That way if you run out of shopping time, you still have your hat and outfit ready to go! Colors that are supposed to be popular this year are shocking pink (easy to coordinate with), floral prints, gold and metallics. Baby pink is also big. Trends in shoes show mules and lower heels, so keep this in mind as you make choices for Kentucky Derby fashion and attire. 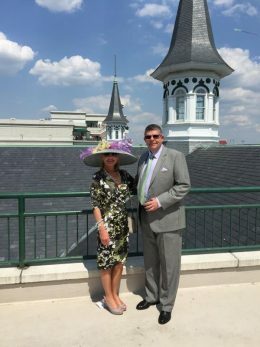 Hat Gift Cards – The perfect Kentucky Derby Gift! When in doubt, give a Polly Singer Gift Card! Breeder’s Cup Is Here Again! Polly Singer designs harken back to days of classic elegance. Working by hand with only the finest materials, Polly regards each of her hats as an individual work of art. 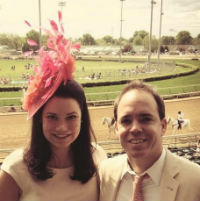 Polly Singer wants to take you behind the scenes to see how our Kentucky Derby hats, and other couture hats are made. Watch how Cafe Machiatto is created. All of Polly's hats are custom and handmade to ensure a proper fit. All hats are made in our Georgetown, Kentucky studio. Hats usually ship within a week and arrive stylishly packaged in our Signature Hat Box. If an item is required in less time, rush fees of $100 will apply. Any items shipping in less than 2 days will incur a $200 rush fee.